The Red Sox have a good offense. That much is evident. You can simply look at the 126 runs they’ve scored through 24 games (a 5.25 run per game clip) to see the production. Or you can look at the pair of beatdowns they put on the lowly Braves in the middle two games of their four-game series in Atlanta in which they scored 24 times in the four games, and their 8-0 drubbing of the Yankees on Saturday night. The Red Sox have scored a lot of runs, but their offense is far from perfect. There appears to be a major flaw in Boston’s offense that could hurt it down the road. That would be a lack of power. Or more specifically, a lack of home runs. The Sox hit 19 home runs through the first 24 games of the season. That’s good for last in the American League and tied for 26th in all of baseball. David Ortiz is the only Red Sox player has reached the five homer mark a month into the season, and only five players have hit more than one. Those look like troubling figures for a team so severely limited on the mound. 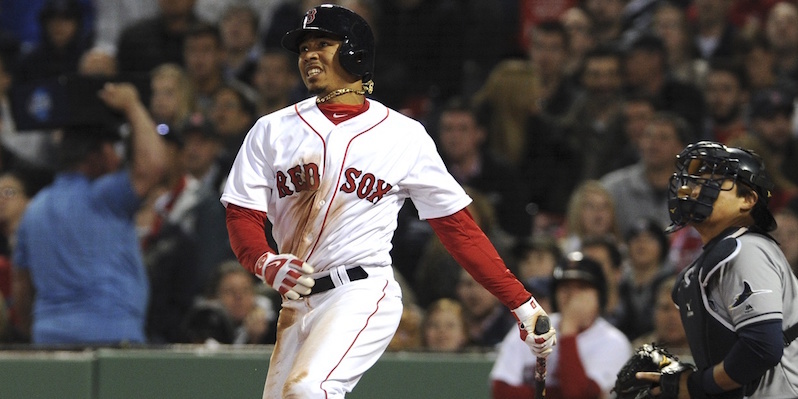 But just because the Red Sox are lacking homers, it doesn’t mean they’re lacking in power. There are other factors in play that make the Red Sox’s offense one of the most potent in baseball, and a threat to score runs at will. The Sox have been a nightmare for many elite pitchers this season. They beat up on Corey Kluber in the season opener, knocked around Marcus Stroman in Toronto and on Friday secured a comeback win off Masahiro Tanaka and Dellin Bentances, capped off by a home run from Ortiz – only his fourth of the season. But Ortiz isn’t the hero on Friday night if not for Jackie Bradley Jr., who hit a two-run double off Tanaka in the seventh to tie the game at 2-2. That’s where the Red Sox’s strength lies offensively – their depth and their ability to hit for extra bases. Entering Sunday, the Sox led the majors in doubles with 66 – 10 more than the Pirates, who are second – and fourth in triples with nine following Bradley’s two-triple performance on Saturday. Those extra bases have helped them score the fourth-most runs in baseball. This lineup wasn’t built to hit a ton of home runs, but it was designed to be deep, balanced and still loaded with power. Their leadoff hitter, Mookie Betts, although still looking to find his groove, is second on the team in home runs with four, but the Red Sox have other four players in the top 25 in doubles so far this season, while Betts also has a pair of triples. Ortiz, Xander Bogaerts, Travis Shaw and Dustin Pedroia all had seven or more doubles this season entering Sunday, with Ortiz leading the group – and tied for the major-league lead – with 11. At 40 years old and in his final season, Ortiz has shown no signs of aging as he is once again one of the game’s most dangerous hitters. He boasts a .338 TAv, and should have one last 30-homer run in him. Then there’s Bogaerts, who’s second on the team with nine doubles. As Ben Carsley noted after last season, the only real gripe about Bogaerts’ 2015 campaign was a lack of power. This season appears to be a bit of a step forward in that department thus far, even if he has just one homer. His .129 ISO is an improvement from his .101 mark last season, as is his .281 TAv. He’s also on pace for about 60 doubles (dreaming big, guys). The only real complaint is the 57.9 ground ball rate compared to the 18.4 percent line drive rate. Shaw has proven to be a major upgrade over 2015 Pablo Sandoval not only with his glove, but also with his bat. He’s third on the team with eight doubles to go with a .301 TAv. His slugging percentage sits at .500, he has a .186 ISO and he’s hitting fly balls at a 47.6 percent rate. Shaw may only have a pair of homers, but it’d be wrong to say there’s a lack of power there. Pedroia’s seven doubles may seem underwhelming compared to his aforementioned teammates, but he appears to be returning to form as the extra-bases machine we knew him as prior to a pair of injury-plagued seasons. Pedroia has a .175 ISO through 23 games. The last time he came close to that mark was in 2012, when he finished with a .160 ISO. Pedroia also boasts a .485 slugging percentage and a 22.1 percent LD%. Those individual efforts alone show us a team that doesn’t need home runs to generate power. As a team, the Red Sox are in the top 10 in both ISO and TAv. They are also second in baseball in BABIP (.340). The Red Sox aren’t the first elite offensive team to lack in home runs. Last year’s World Series champion – the Royals – also finished in the bottom half of baseball in home runs, but finished in the upper half in most other categories. It’s hard to make much of a comparison with the Red Sox’s stats coming after only 24 games, but the rankings paint an encouraging picture. Of course, the Royals didn’t win the World Series solely because of their offense. They also had solid starting pitching and a dominant bullpen. But Kansas City was an elite offensive team that could hit for power, even if the ball wasn’t leaving the yard. The Red Sox’s offensive has the makings of something similar production-wise. The low home run totals may tell you the Red Sox aren’t much of a power-hitting team, but most other offensive categories tell you they’ve been good enough. The Sox are hitting for extra bases at an impressive rate and scoring plenty of runs – enough to give them a winning record despite a 21st-ranked team ERA. The power is already there, and it’s fair to believe more home runs will come. Boston ranked 15th in baseball with 161 home runs last season with a lineup that includes many of the same players as last season. But even if they don’t come, there’s little reason for concern. What they have now is all the power they need. Price Check: Where’s the Gas, Buddy?